The last of the Eight Extra Mai are the Yin Jue Mai 陰蹻脈 and the Yang Jue Mai 陽蹻脈. Jue 蹻 means bridge, but this bridge is connected to the legs and is not the normal bridge qiao 橋. So obviously these two mai connect with the legs and in fact both start in the feet, pass up through the boy and end up at the head. The Yin Jue Mai works more on the Kidneys. The Yin Jue Mai starts at the Ran Gu Point 然谷穴, which is at the inside of the foot at the top of the arch, it then passes up the inside of the leg to the Lower Dantian area. From there it goes up to the Que Pen Point 缺盆穴, across to the chin and then up the face to the Jing Ming Point 睛明穴 at the inside corner of the eye. 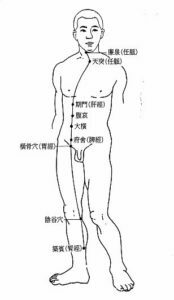 The Yang Jue Mai starts at the Shen Mai Point 申脈穴 on the outside of the foot, goes to the Kun Lun Point 昆侖穴, up to the Huan Tiao Point 環跳穴, to the Ju Liao Point 居髎穴 where it splits in to two with one line going out to the Wei Dao Point 維道穴, the Jing Men Point 京門穴 an then the Jian Yu Point 肩髃穴. The other line goes from the Ju Liao Point vertically up the to the Jian Yu Point 肩髃穴 and so the two lines meet up. 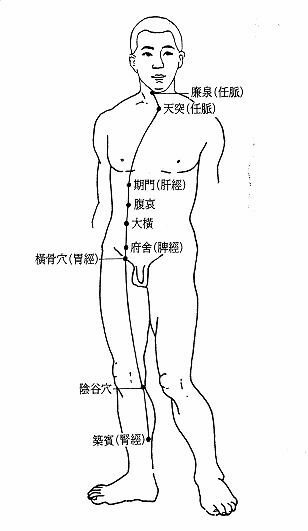 The mai then continues up to the face to the Jing Ming Point 睛明穴, passes over the top of the head finally reaching the Feng Chi Point 風池穴. The Yang Jue Mai is more complicated than the other mai as it splits into two and so it means more Qi is needed to make this mai flow. However of the all the Eight Extra Mai, the Chong Ma i衝脈 is the most important and so is the one we should focus more on.